I would have somewhat changed the title on this myself. Here is the idea from Chris Pinto’s movie: a 19 year old Greek named Simonides wrote Codex Sinaiticus in late 1839/early 1840. He did so with some assistance from his uncle. He used the Moscow Bible and Codex Alexandrinus as his primary sources. His uncle made corrections. The codex was to be given as a gift to the Czar, but this never happened. His uncle died, he ran out of parchment (having found what he did use in the library in a massively bound volume that just happened to be mainly blank pages), and the gift idea was abandoned. Instead, the volume made its way to the library at St. Catherine’s were, it is alleged, some hanky-panky started taking place, so that when Simonides saw it again over a decade later, it had been altered and made to look much older than it should. Then it fell into the hands of the arrogant, evil, Jesuit-compromised Constantine von Tischendorf, who, as the obedient drone of the Jesuit order he evidently was (though professing to be a Protestant and writing in defense of the Gospels and odd things like that), pawned it off to the world as a 4th century manuscript. When Simonides saw it, he recognized it was his own work, and tried to warn the world about Tischendorf’s error. But alas, the Jesuits were in control of everything, including the newspapers and even academia itself, and so after a brief battle, Simonides lost and faded from history. 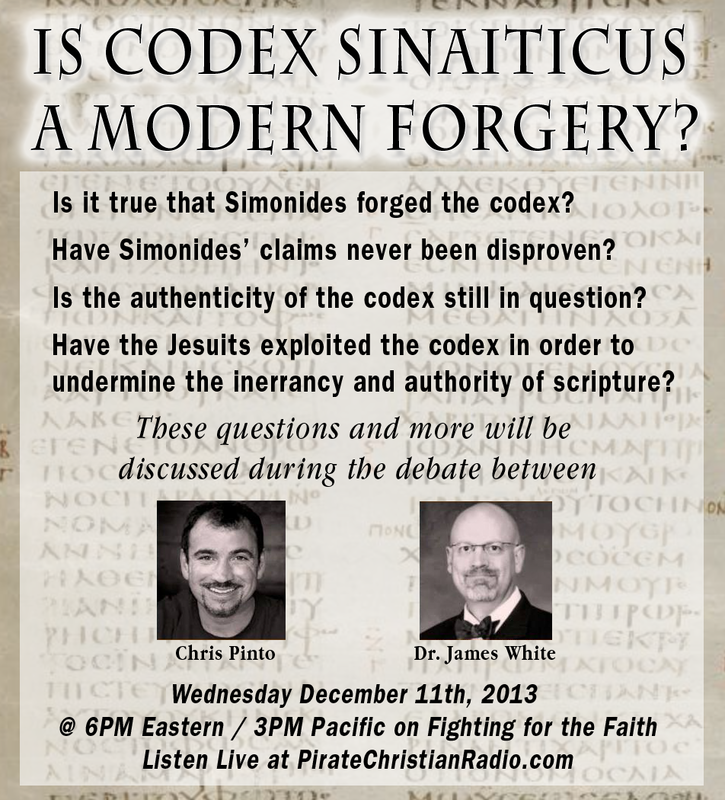 Now, according to Pinto, Sinaiticus is THE chief weapon used by the Jesuits against sola scriptura and biblical inerrancy. This he derives from some comments in a BBC documentary where wild eyed liberals, obviously grossly ignorant of the actual study of Sinaiticus, and likewise oblivious to conservative work on the topic, allege that the corrections show a “fluid” state to the NT text even in the 4th century. Therefore, brother Pinto is warning the church against Sinaiticus, and, by extension, Vaticanus, most of the papyri discovered since Sinaiticus, etc. He is, of course, an advocate of, as I understand it, the Textus Receptus, or, failing that, at least the Byzantine text type. Hence, the issue isn’t whether Sinaiticus is a forgery, it is whether it was an honestly made production of 1840 which has been twisted into a weapon of mass Bible destruction by the Jesuits. That’s the theory, as anyone can tell by investing three hours in watching Mr. Pinto’s film, which I provide below. Let me say that I believe this will be a very challenging debate for me. I only have 15 minutes to lay out my case. That is precious little time, I assure you. 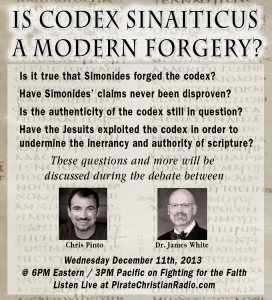 The primary evidence that, in my opinion, utterly disproves the Simonides Theory is textual in nature: that is, the sources Simonides himself identified (the Moscow Bible, Codex Alexandrinus) could never provide him the basis for the absolutely unique, complex character of the text of Sinaiticus. It is simply impossible. Sinaiticus contains readings utterly unknown in 1840; yet, those very readings have been found in the much earlier papyri that have come to light since then. Simonides could not have foreseen these readings. Further, study of Sinaiticus has identified at least three scribes who labored, not consecutively, but often concurrently, on the codex, with interaction between them. This is utterly outside the realm of Simonides’ claims. The many thousands of corrections likewise show a much larger group working on the manuscript than Simonides’ story can allow. Defaulting back to the, “Well, it was altered after it’s arrival at St. Catherine’s” requires the proponent of this theory to identify who did this, when, and why. Shadowy figures of Jesuits in long robes with spooky music is insufficient as evidence for truth loving folks. So I hope you will tune in to Fighting for the Faith this afternoon at 6pm Eastern time. It is an important topic and an important debate!